Paris, Je t’Aime – Finally in Lima! | personal.amy-wong.com - A Blog by Amy Wong. Paris, Je t’Aime – Finally in Lima! 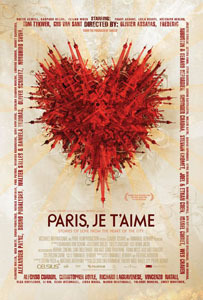 The short films collection of Paris Je t’Aime was FINALLY released in Lima. It was released in Cannes in 2006, did some weeks of running through some small screen, and was released on DVD on 2007. The two-disc special edition has been in my collection since then, but now YOU… Peruvian movie-goer, can go to the cinema and catch it on the big screen. Don’t forget that Centro Cultural Peruano Japones will be showing Shinobu Yaguchi’s Waterboys and Swing Girls this month.